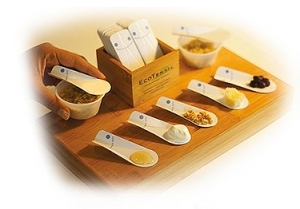 Produced using renewable cardboard, EcoTensil spoons are certified compostable. EcoTensil spoons are manufactured in the USA. These disposable spoons are made with far less material than other spoons. In one box there are five thousand EcoTensil spoons. In the same box, you could fit only one thousand disposable spoons. EcoTensil spoons leave a much smaller carbon footprint. Long lasting, EcoTensil spoons are full sized and made from sturdy paperboard. Similar to a milk carton, EcoTensil spoons are resistant to moisture, making them perfect for eating soft and bite-sized foods. EcoTensil spoons can be used for many different events and situations. They are great for fast food restaurants, fro-yo shops and much more. So “Show Your Green” with these utensils. Eliminate “one taste, plastic waste” with these eco-friendly tasting spoons made from silky-smooth paperboard. In one fold, they become the perfect taster for in-store or event sampling, and cost less than compostable tasting spoons.